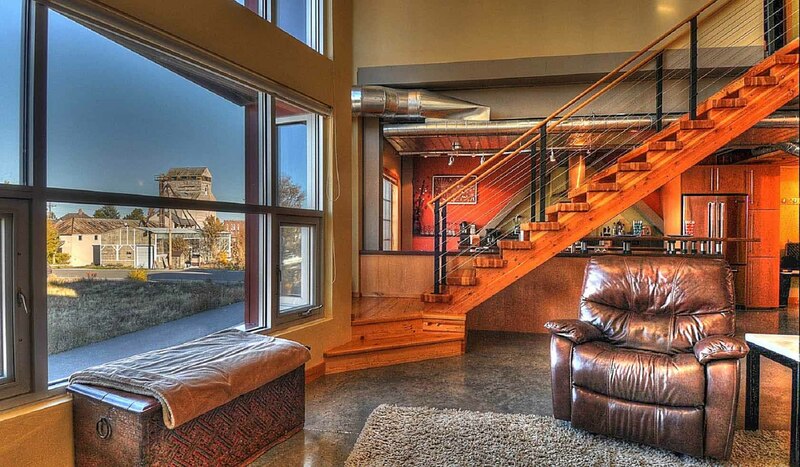 Enjoy the luxury of this loft within Bozeman's Northeast neighborhood! Very private upper deck with fabulous mountain views and a hot tub. This home has air conditioning. High speed Internet provided! Brief Description: This two bedroom condo is located in Bozeman's Northeast neighborhood. This historic part of town was declared an urban renewal district in 2005 and a mixture of old grain elevators, businesses, newly restored homes, and historic old homes fill block after block. The architecture has an industrial look. Perched above some commercial space, the home climbs three levels with two bedrooms and two and a half bathrooms. The main level has all of the living and kitchen area, a laundry area and a half bath. The third level of the home is a bright office/sleeping space with access to a private deck with a hot tub. The home has modern appliances, gorgeous stained cement floors and counter tops, and beautiful wood staircases. Bedrooms and bathrooms: The second level has two bedrooms each with a queen size bed. There is a full bathroom off of the master bedroom with a large tiled shower with dual showerheads. There is a full bathroom with a tub/shower combination off the hall just outside of the guest bedroom. The third sleeping space is on the third level of the condo with a double bed and a private sleeping space. There is a deck off this room with a hot tub. On the main level of the house there is a half bath off the kitchen. Kitchen and dining: This kitchen is beautifully finished with concrete countertops, stainless steel Jenn Air appliances and a full selection of cookware and serving ware for your stay. The kitchen is open to the living and dining areas. The dining table seats six comfortably and there is seating for two at the bar between the kitchen and living area. There is also a little breakfast nook in the kitchen where you can enjoy your morning coffee. Living room: The living area has a very comfy sofa and a nice leather chair situated around a large flat screen television. The T.V. has full Internet capability, allowing guests to access services such as Pandora, Facebook, Netflix, Hulu and many others with a great sound system. There are many DVD's and CD's for your enjoyment. There are large windows that let in great light. Activities nearby: Recreational opportunities are just minutes away as the area connects to a trail network that is great for both biking and hiking. The town of Bozeman has an incredible selection of fine and casual dining, plus endless art galleries and downtown shops to browse. Yellowstone National Park is just an hour and half drive away. For an especially memorable experience in the park, book a specialized private tour with our sister company, Greater Yellowstone Guides. Ski areas, golf courses, hiking, rafting, fishing, hot springs and horseback riding are all nearby. There's so much to do!